Immunology graduate student Janelle Veazey, has received an F31 National Research Service Award from the NIH. This pre-doctoral fellowship will support her research investigating a new role for airway epithelial protein kinase D in anti-viral immunity. Dr. Georas has joined the NIH Precision Interventions for Severe and Exacerbation Prone Asthma (PrecISE) Network. This new NIH initiative will establish a network of 10 Clinical Centers in the U.S. conducting innovative research using adaptive clinical trials. Dr. Georas serves as Steering Committee chair, with co-chair Dr. Rosalind Wright. 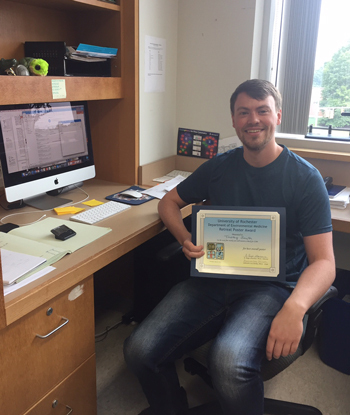 Congratulations to second year Toxicology graduate student Tim Smyth for winning an award for his poster and presentation at the annual Toxicology Retreat. Tim’s poster was entitled “Diesel exhaust particles disrupt epithelial barrier function by altering tricellin expression”. Physician-scientist Steve N. Georas, M.D., professor of Medicine, Environmental Medicine, Microbiology and Immunology, was installed as the inaugural Parkes Family Professor June 5. Walter and the late Carmina Parkes, and their children Susan, Tom and Linda, were driven to open the first asthma center in the region. They have been a steady force in the growth of the UR Medicine’s Mary M. Parkes Center for Asthma, Allergy and Pulmonary Care, working closely with center leaders, educators and scientists. The center is located on Red Creek Drive in Henrietta and serves as the leader for the diagnosis, treatment and research of acute asthma, allergies and other pulmonary diseases. “It was our family’s dream to honor the memory of our daughter with the center. Now, establishing a professorship allows us to make it everlasting,” said Walter Parkes, chairman of O’Connell Electric Co. The family has committed $1.5 million to the University. Mary Parkes was diagnosed with acute asthma as a young girl and went on to study nursing. She was an intensive care unit nurse before the lung disease progressed. She was hospitalized more than 50 times in the decades before her death in 1991. The center was established in 1995. McNally is a steadfast supporter and has collaborated with the Junior Builders Exchange to organize an annual golf tournament for the past 21 years to support the Parkes Center. This year’s tournament will be held Sept. 7. Georas is a busy clinician-scientist who balances the patient care with leadership of a National Institutes of Health-funded laboratory at URMC. He is part of the collaborative teams caring for patients in the Medical Intensive Care Units at UR Medicine’s Strong Memorial and Highland hospitals, as well at Mary M. Parkes Center for Asthma, Allergy and Pulmonary Care. Georas is studying how the lung’s immune system responds to inhaled particles, allergens and viruses, and how this process breaks down in asthma leading to potentially dangerous immune responses that can cause allergic airway inflammation and difficulty breathing. He is also working to develop techniques to identify people who are at greater risk of developing life-threatening asthma and need intensive therapies. “The support we’ve received from the Parkes family for our asthma research is invaluable and has allowed us to make steady progress toward new pathways for asthma treatment,” Georas said. He is an internationally recognized thought leader in asthma research, and has served on advisory committees to the U.S. Food and Drug Administration, National Institutes of Health and numerous professional societies. Later this year he will chair the NIH panel review for the PrecISE Asthma Network, which will establish the next generation of asthma centers developing personalized treatments for severe asthmatics. A graduate of Brown University and its medical school, he completed an Internal Medicine internship and residency at Duke University Medical Center. After a fellowship in Pulmonary and Critical Care Medicine at Johns Hopkins University, he joined its faculty and conducted research into asthma and allergies. In 2006, Georas joined URMC and served as chief of the Division of Pulmonary & Critical Care Medicine until 2010. Georas has been honored for his teaching and mentorship of students, post-doctoral fellows and junior faculty. He has published more than 85 research articles and chapters on asthma immunology and the care of patients with pulmonary diseases. Ms. Veazey won a travel award from the Graduate Women in Science to attend the 2017 American Thoracic Society Meeting. She will present her work entitled “Epithelial PKD3 is a novel regulatory of anti-viral innate immunity”. In 2016, she was one of a handful of graduate students selected to have lunch with NIH Director Dr. Francis Collins during his visit to the University. Dr. Chapman received a Lung Biology Pilot Project Award to explore how electric field stimulation impacts mucosal immunity using asthma models. Together with Dr. Georas and Dr. David Dean (Neonatology), the team also received a Technology Development Fund award from UR Ventures to develop the therapeutic potential of this exciting new technology. Dr. Georas concluded a four-year stint as a member of the PADAC, advising the Food and Drug Administration on new drug applications for asthma and other diseases. During this time, new drugs for asthma were approved including mepolizumab, reslizumab, and Breo Ellipta. After serving two years as Associate Editor, Dr. Georas accepted a term as Section Editor of the Journal of Immunology, the flagship journal of the American Association of Immunologists. He is responsible for reviewing submitted manuscripts related to asthma and allergic airway inflammation.